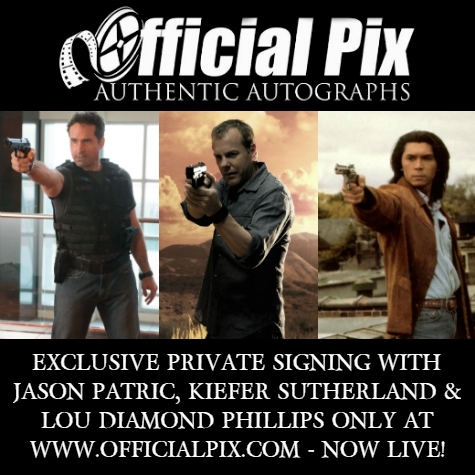 Exclusive Private Signing With Kiefer Sutherland, Jason Patric & Lou Diamond Phillips Now Live! By Official Pix by C2 Ventures, Inc.
You can now head over to our Current Signings page and check out more than 100 different Pre-Order options along with standard and CGC Signature Series Send-In options for Kiefer, Jason & Lou. Orders will be taken through Monday, August 13th and all items must arrive by Friday, August 17th. Since 2001, Official Pix by C2 Ventures, Inc. has been the most trusted name in STAR WARS autographs, providing more authentic signatures to fans than any other provider worldwide. From 2002-2015, C2 Ventures worked closely with ReedPOP and Lucasfilm Ltd. to produce the autograph program for STAR WARS Celebrations throughout the world. In addition to STAR WARS, we also have many other celebrities from other genres of television and film sign throughout each year both privately and at major conventions where we provide the official Autograph Pre-Order & Send-In Service. All of our autographs are obtained by us assuring 100% authenticity every time. If we didn't have it signed ourselves, we don't sell it. C2 Ventures is a partnership of long-time STAR WARS fans, Ben Stevens and Philip Wise.